2D Electrical Resistivity Imaging (ERI) was used for karst and saltwater intrusion mapping for the construction of a thermal plant at Cap Rhir site—located on the Atlantic Coast, about 30 km north of Agadir, Southern Morocco. The site is characterized by varying thicknesses of Quaternary sediments overlying thick sequences of Jurassic limestone and marls. In the outcrops, the limestone displays many systems of fractures and sporadic dissolution cavities. Except for the occurrence of occasional abrupt cliffs, the topography of the site is generally smooth. The vegetation is sparse and the soil that was once cultivated is now sterile. Electrical resistivity tomography was carried out for the detection and identification of possible buried cavities, large potential fractures or any other subsoil defects, such as ancient relics, which may present a potential hazard to the thermal plant project. The evaluation of the impact on groundwater resources was also one of the objectives of the study. 2D field apparent resistivity data was performed along 16 lines perpendicular to the coastline, separated by 100 m to 200 m and 3 other lines parallel to the coast with the SuperSting™ R8/IP, Switchbox, and the Passive Electrode Cables. The quality of the data acquisition was completely controlled by the computer software which, before the start of any measurement, checks the electrode connectivity to the soil and magnitude of the contact resistances. 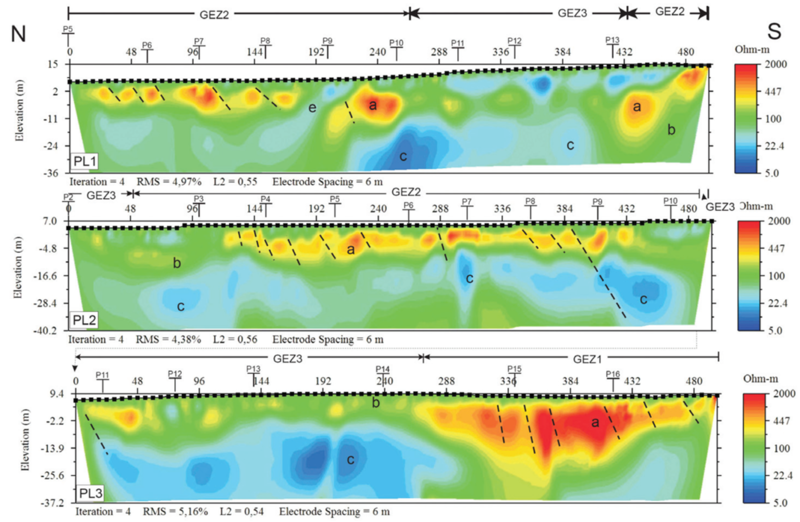 The 3 m and 5 m electrode spacing were chosen with an estimated investigation depth between 30 m and 50 m. In the reduction and inversion of the apparent resistivity data, the EarthImager™ 2D software was used. The integration of the apparent resistivity inversion results, the surface geology and the borehole cores data indicate, in addition to the near surface topsoil cover, two prominent high-and-low-resistivity areas on all the resistivity profiles. 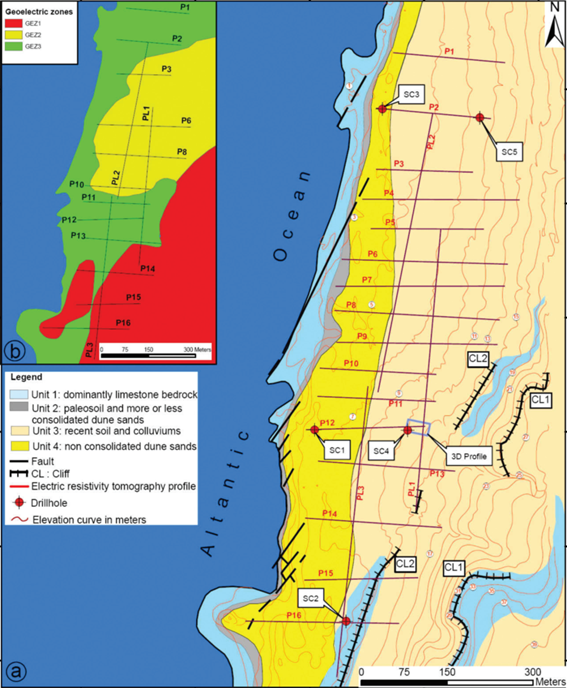 The high-resistivity readings of up to 2000 Ohm-m correlate with the very compact reef limestone that crops out in the southern portion of the study area and with the more or less resistive block-faulted limestone that occurs in the northern portion of the study area. Nevertheless, the most important findings that might have a negative impact on the thermal plant project construction, local ecosystems and groundwater resources farther inland, are the low-resistivity anomalies that dominate all the 2D resistivity profiles at relatively shallow depth. They show low-resistivity values between 10 Ohm-m and 20 Ohm-m and have geometrical forms of alternating nearly spherical and elongate bodies. In accordance with the outcrops and the borehole cores, these features are likely to represent saltwater-filled buried karstic cavities connected by channels, caused by limestone dissolution. 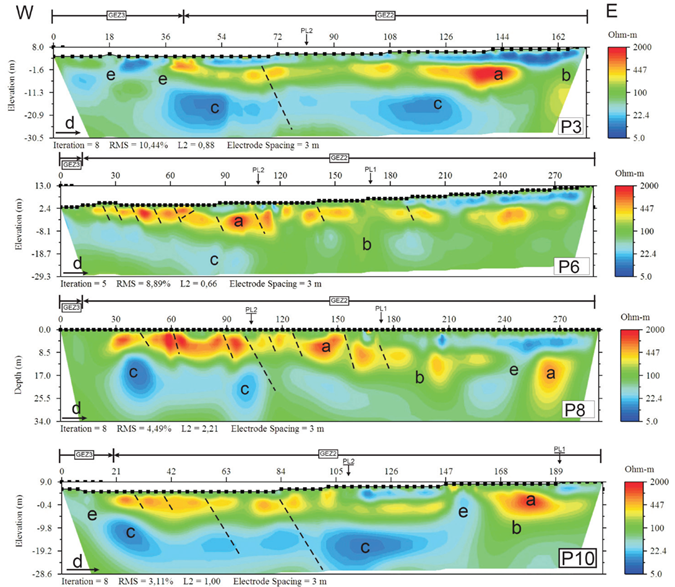 An alternative interpretation could be that excessive carbonate dissolution has resulted only in a nested network of large communicating pores filled with marine waters. 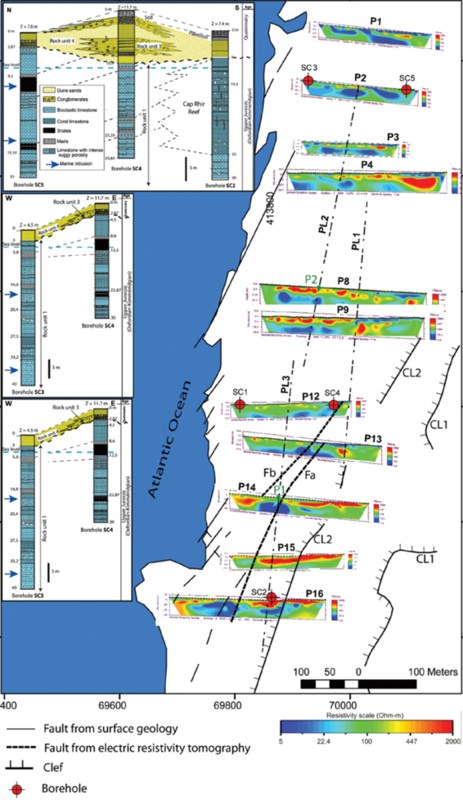 Major faults, spanning the entire study area, were imaged on the resistivity profiles; sharp cliffs were also identified and were interpreted as marks of ancient shorelines.